“Sustainability as a Shared Challenge” was one of 20 commitments made by the University of Saskatchewan in its Second Integrated Plan. 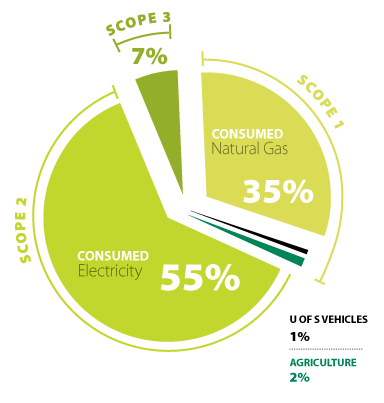 The Sustainability Commitment Working Group (SCWG) was formed and launched into three years of investigation, benchmarking and extensive stakeholder consultation to understand the gap between where we were and where we should be. From the information gathered, the SCWG derived a list of strategic initiatives designed to infuse sustainability into all areas of campus activity—education, research, operations, governance and community engagement. 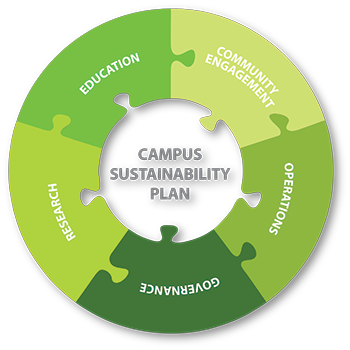 The Campus Sustainability Plan is the result. The implementation of the Climate Action Plan is underway. The university's 2016 Greenhouse Gas Inventory identified a 1.1% decrease in total emissions and a 13.35% decrease in emissions per square meter as compared to 2006. In early 2019, an updated Greenhouse Gas Inventory will determine our progress to date. The university is committed to making certain that our energy and water resources are used as efficiently as possible while providing adequate levels of service and comfort. In keeping with this commitment, a new Energy and Water Conservation Policy was approved by the Board of Governors on October 9, 2014. Beginning in 2015, the Office of Sustainability launched the Energy Action Plan (EAP) to address energy usage and conservation issues at the University of Saskatchewan. The EAP was developed in partnership with SaskPower and is composed of 3 parts: LED upgrades and retrofits, recommissioning for selected older buildings, and the development of an Energy Management Information System (EMIS) pilot project to assess the potential impact on energy management. The Education and Geology Buildings have been reviewed by external consultants and based on their recommendations, modifications will be made to the operations and equipment to improve energy efficiency.